My blog is about Ice Creams, Sorbets and Gelatos. I will guide you to make Ice Creams, sorbets and Gelatos with many flavors from around the world through my experiences. Come back to our childhood with me. This classic cocktail mix is served frozen, not unlike a snow cone — and very definitely one for adults! Put 2 margarita glasses in the freezer for at least 1 hour. Mix the tequila and lime juice and place in the freezer. Put the salt onto a shallow plate. When ready to serve, dip the rim of the chilled glasses in the salt (because the glasses are cold, the salt will stick to the rim). 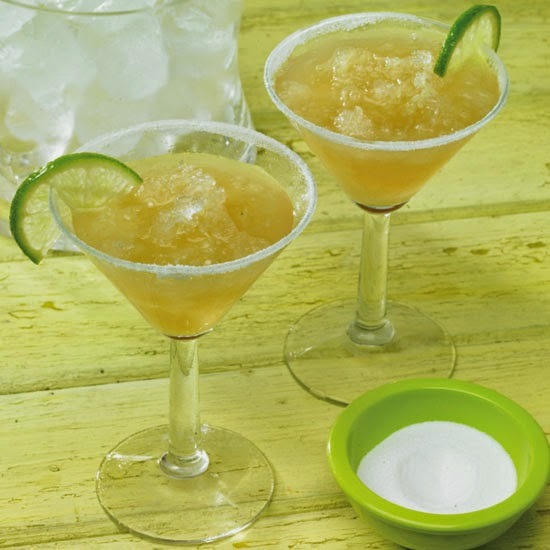 Fill the glasses with the crushed ice and then pour in the tequila–lime juice mixture. Serve immediately with the piece of lime. Prepare the basic recipe, replacing the lime juice with cranberry juice. When preparing the basic recipe, replace the lime juice with blood orange juice. Prepare the basic recipe, replacing the lime juice with strained raspberry purée. If you wish, replace the salt with superfine sugar. Prepare the basic recipe, adding 1/4 cup mango or papaya juice to the tequila and lime juice before freezing. If you wish, replace the salt with superfine sugar. Prepare the basic recipe and add 1/4 cup coconut milk to the tequila and lime juice before freezing. © Ice-Cream.Info 2014-2016 All rights reserved. Watermark theme. Powered by Blogger.